Hollywood has created numerous all american heroes. The latest one off the mill is that of Chris Kyle, the American Sniper. In this article, Kyle’s profile will be compared to the legendary character of John J Rambo. It is important to note that in this article the film American Sniper has not been considered as a biopic. Only the characters portrayed in the movies have been compared. John Rambo and Chris Kyle both have a few commonalities. The most obvious of all is the PTSD that they both suffer. Listed below are their differences as it will be interesting to contrast the moral and psychological profile of the two characters. With American Sniper such a huge success, it surely reflects the mood of the USA if not the whole world. And thus even a tongue in cheek comparison of successful characters from two different generations can reveal how the American taste has changed for its heroes over the years. 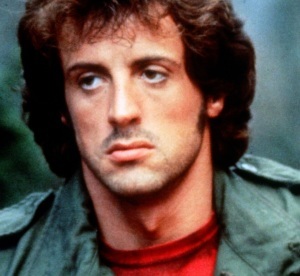 John Rambo reflects Jimmy Carters reign and so operates on the principle of defensive warfare. He only battles when war is imposed on him. And even then he is not prone to pulling the trigger first. To put in his own words “They drew first blood, not me”. While Cowboy Chris Kyle, very fittingly a product of the George Bush era believes in the idea of pre-emptive strikes for the “safety” for his team on the offence on an invaded land in an illegal war. In well over a hundred confirmed kills of both John J. and Chris, only Rambo can claim never to have killed a child or woman. In fact the Green Beret has been seen protecting them, freeing and saving them from the enemy on numerous occasions. Although both characters are going through an internal turmoil- a war they cannot leave behind when home- however, it is only Rambo that questions the reality around him. He takes no prisoners in showing his dislike of the system. He yearns for the love of his country in return for his own unquestionable patriotism. In contrast Chris Kyle has infallible belief on the governing institutions. Life and even politics for him is black and white. He has a simple philosophy to quell his internal rage i.e. perpetration of further violence, taking out more of the enemy to protect his own. Introvert by nature, both characters generally do not have a lot to share. Chris Kyle however does have the ability to rescue vulnerable women from the pubs. One cannot see Rambo doing the same unless someone accidentally bumped into him and has a taste for short, crisp, deep and meaningful conversation. Chris Kyle definitely edges Rambo on having a slightly more unmuted sense of humour. This remains the verdict despite John J’s legendary quip facing a marching battalion with just colonel Trautman. He shouted “Surrounding them is out”. John J helps the vulnerable and for his pastime, he clears the jungle of deadly reptiles and uses his blacksmith skills to make tools of mouse destruction. He uses his strength to chisel out a monastery and eventually raises cattle in his ranch. Although rumour has it that he is at the present getting embroiled in fending off of a Mexican drug cartel, but one will have to wait and see to be sure. Fathering two kids in between two tours wasn’t bad going by Chris Kyle. After psychological evaluation and therapy, he finds solace in helping war veterans. Unfortunately for Chris, one of these veterans turned out to be quite a handful. Both men are not religious to the level pursuing rituals but John J is clearly influenced by Buddhism and wants to denounce violence but unluckily finds himself in situations out of his control. A forensic research of his faith reveals that he has adopted Theravada school of Buddhism. Chris follows the religion of the wild wild western unorthodox Christianity. Veteran of numerous incursions behind the enemy lines, John Jay Rambo is a clear winner for his longevity over decades. His appeal is global and legacy will last longer. He has four installments of his character portrayal already in the bag (excluding Son of Rambo). Chris Kyle even with his four intense tours unfortunately cannot follow suit. It is clear from the comparison that John Rambo triumphs Chris Kyle as the hero the world deserves and the one it needs at the moment. Share this article to promote peace in the world.